Once upon a time we all lived in small towns, or at least tight knit communities and neighborhoods. If you needed your hair cut you’d go to Hank’s Barber Shop, you bought your sandwiches from Sidoti’s Deli, and the pharmacy on the corner didn’t belong to Walgreens. Businesses didn’t have to market, network, advertise, tweet or blog about their services to get and keep their customers. They offered their goods and services, and people came for them. It’s how business was done. That was then. Welcome to the modern world! If you think you can rely on your business surviving the old fashioned way, where people buy from you because they always have, stop and think again! Even if you’re located in a sparsely populated burg, the town folk now have the internet, Iphones and all kinds of other techy gadgets… they can find it cheaper, better and quicker on Amazon if you don’t get your head in the game and convince them they want their money flowing in your direction. USING A ROLODEX: Seriously? How about a CRM or at the very least pop those numbers into your phone! Who even has a Rolodex anymore?! u want your business to thrive. STAYING DISORGANIZED: Simple things like losing phone numbers, forgetting appointments and not being able to find important documentation will destroy you. Can’t do it alone? Get a VA to help you get your act together. Don’t let your ADD stand in the way of your personal and professional success. The important thing to remember about giving mediocre customer service to your clients is that most people don’t complain… they simply spend their money somewhere else. We can all think back to a time when we went to a restaurant and the food was cold or overcooked, the waiter gave horrible service, and the whole overall experience was expensive and lousy. Occasionally (and only if we are feeling a bit bitchy maybe) we’ll complain to the manager, but typically we pay our bills in silence…and the next time we meet our friends for dinner we choose one of the other 55 restaurants within that two-mile radius. When the competition is many, it’s easier to move on to a new provider than to get in a tizzy about the current one. Life is stressful enough… who needs the conflict? OUCH. This doesn’t just hurt a business; it can kill it. What if you aren’t running a restaurant? With some businesses it’s not quite as transparent. A good manager or maître de will pick up on the customers sputtering under their breath, moving the food around with their forks in little piles on the plate, uneaten. If you are a Realtor, a computer programmer, a service-oriented business however… well, how do you even know? Maybe it’s time to do a little self-evaluation. Do you ask if your customers are happy? Even longstanding clients will appreciate the effort in a quick follow up phone call asking if they are satisfied. If you are too busy to call then email… or have your assistant make the call. How you communicate isn’t important, but they will notice that you valued their business enough to make sure you didn’t leave any loose ends. Do you get referrals? If most of your clients contacted you because word on the street is that you are the best, congratulations. The best form of advertisement as we all know is your clients singing your praises. Not getting referrals? Maybe it’s time to start making contact with your clients to find out if there is a reason why. Are you aware of your clients’ needs? Make sure you haven’t gotten too complacent. It’s easy to be so comfortable with your clients that you do everything the same way all the time. Don’t get lazy… make sure this is what they want and that you are still meeting their needs. Pay attention! Customer retention is one of the most important aspects of your business. If you are perceptive and caring, it should also be one of the easiest. Do unto others… the timeless bible quote that fits within both our personal and business worlds. Always remember that most clients will not complain… and that there are 55 other restaurants within that 2-mile stretch. 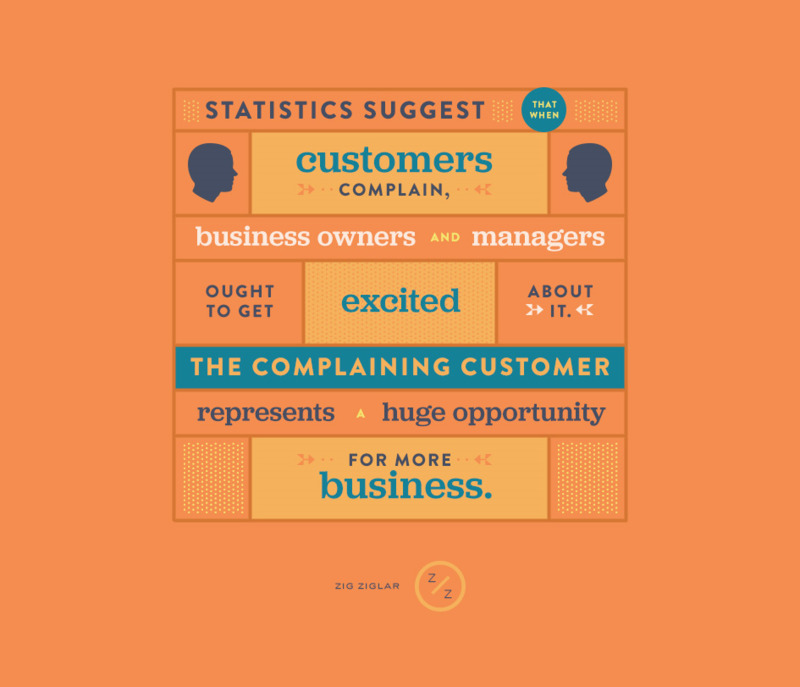 10 Ways to Keep Your Customers Happy…and Keep Them! In 2010 the television series Undercover Boss had a segment where the President and CEO of 7-Eleven, Joe DePinto, traveled to Shirley, New York. He wanted to see why this store was the biggest seller of coffee in the 7-Eleven system with over 2,500 cups of coffee guzzled down every day. He discovered that the manager of this high volume store was a sharp lady named Dolores who knew all of the customers by name. WOW. Can you imagine? Some would say this is customer service at its most extreme, but it goes much deeper than that. Certainly there must be other places to get a cup of joe in the morning, but something about Dolores and her personal attention kept the customers going back…they needed to see her when they stopped. It wasn’t just about the coffee. They wanted someone to ask how the job interview went…how it was going at home with the sick kids… In fact, eventually it wasn’t about the coffee at all. It was about validation. Some would argue that the example above is a little over the top… that it has a ring of “sucking up” to one’s clientele. That isn’t true at all. There’s an old saying, “Keep your customers happy or somebody else will.” This is true today more than ever. Competition is everywhere, and there are computer programs which allow people to do many of their own tasks if they have the time (and skills) to learn the software. It comes down to how you want to spend your minutes and money, but who doesn’t like to feel appreciated and yes… a little bit special? The goal is to keep your customers happy, and keep them coming back. If you aren’t concerned about retention, marketing is a waste of time and resources. These ten simple tips will remind your clients why they chose you, and will keep them coming back for more. What are your client’s goals? You need to know what your client really wants from you. If you need clarification, ask. Communication is key. Keep asking until you really get it. They will appreciate that you are trying to tailor what you do to meet their needs. MEET DEADLINES. If you promise something by a certain date be sure to deliver. This tells your client that they are important. If you bit off more than you can chew with a project be sure to communicate that the scope of this was much larger than you had anticipated. See if they can get by with what you have done thus far and come up with a fair and doable completion date for the remainder. WOW THEM. Think of the presidential elections (Ughhhhhh!) Do you ever notice the significant difference between how a candidate acts while campaigning compared to when elected? Keep campaigning! Remember the 3 E’s: Excitement, Enthusiasm, Exuberance! That’s how you won your client over. Don’t lose that spark once you’ve gotten the job. BE CONSISTENT. People find comfort in knowing what to expect. PROVIDE TOP NOTCH QUALITY. This is right up there with “WOW THEM”. Just because someone is a longstanding client does not mean you can shirk on doing a bang up job for them. DON’T LEAVE THEM OUT OF SPECIAL PROMOTIONS. Best example here is cable TV and telephone services. They offer wonderful specials for new customers, and sometimes even better promotions trying to entice old customers back. So who gets left in the dust? YUP, you guessed it! The loyal customers who have stuck around forever… and the only way to get the special deal is to leave. Something is definitely wrong with this picture! If you have a slick plan when marketing to new clientele make sure you have your existing ones covered. You don’t want your client to jump ship and move on to somebody else because they are feeling neglected and unappreciated. SHOW APPRECIATION FOR REFERRALS. Word of mouth is always the best advertising, and if your clients love you they will sing your praises. Remember to say thank you personally, and everybody loves a gift card to their favorite coffee place. GET TO KNOW YOUR CLIENTS. You don’t have to be best buddies or grab cocktails together, but show an interest in who they are. What are their passions and what motivates them? you do it will show. Like 7-Eleven Dolores, this attitude will spill over into your daily work routine. Your client will hear the smile in your voice when you answer their call. As a business owner or entrepreneur, retention is critical. A client who feels appreciated and is well cared for by you will not consider moving on. Do your best. If your clientele is happy, the competition won’t get his foot in the door while campaigning. You’ve already won the election!